Many Tableau customers have large buckets of data stored in Amazon Simple Storage Service (Amazon S3). In the past, making use of that data with Tableau has required a great deal of preparation. In November 2016, Amazon Web Services announced a new serverless interactive query service called Amazon Athena that lets you analyze your data stored in Amazon S3 using standard SQL queries. Since Amazon Athena’s launch, Tableau has worked to provide best-in-class support for this new service. The Tableau connector has been tested by many customers with very positive feedback—and we’re excited to announce that it will ship with Tableau Desktop, Server, and Online in version 10.3. What does the Amazon Athena connector get me? With the Amazon Athena connector, customers can quickly and directly connect Tableau to their Amazon S3 data for fast discovery and analysis, with drag-and-drop ease. In particular, we’re excited about the opportunities this presents for customers who have always wanted to learn and explore what’s in Amazon S3, so that they can make informed decisions on whether or not to provision it, and where (Hadoop, Impala, Amazon EMR, Amazon Redshift). Amazon Athena can make use of structured and semi-structured datasets based on common file types like CSV, JSON, and other columnar formats like Apache Parquet. 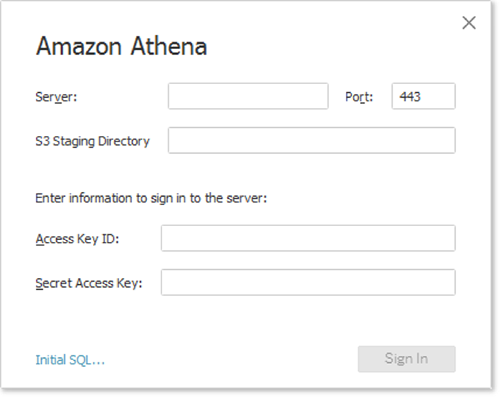 Amazon Athena can access encrypted data on Amazon S3 and has support for the AWS Key Management Service (KMS). AWS provides a JDBC driver for connectivity. Underneath the covers, Amazon Athena uses Presto to provide standard SQL support with a variety of data formats. Amazon Athena’s data catalog is Hive Metastore-compatible, using Apache Hive DDL to define tables. Users can create and remove schemas without impacting the underlying data. Install the latest version of 64-bit Java. Get the driver (download here). Windows: Save the Amazon Athena JDBC jar in the C:\Program Files\Tableau\Drivers location. 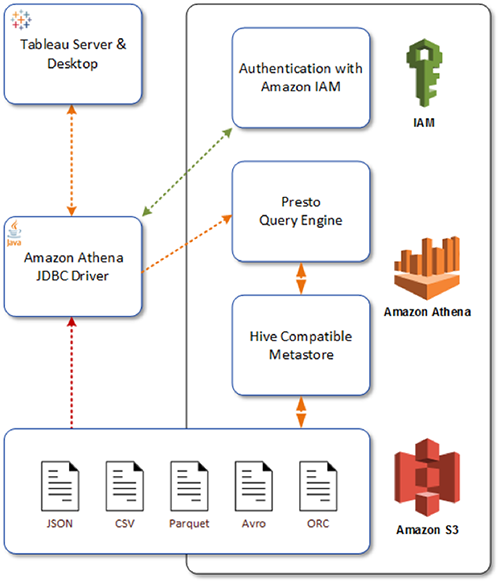 Mac: Save the Amazon Athena JDBC jar in the ~/Library/Tableau/Drivers location. Once these steps are completed, you can add a new Amazon Athena connection and begin configuring it. There are a few interesting things to note about the connection dialog for Amazon Athena. The lack of an SSL checkbox is not an indicator for a lack of support. In fact, Amazon Athena uses SSL all the time, so be sure to specify port 443. Amazon S3 Staging Directory: Find this setting in the AWS console for Amazon Athena. This is great! Just tried it and after some initial hiccups like JDBC driver, jar file, etc. was able to get this to work. My question is when you say 'this presents for customers who have always wanted to learn and explore what’s in Amazon S3', it still needs someone to configure the databases and tables in Athena before Tableau users can start reading it in, correct? Have you got the answer for 'still needs someone to configure the databases and tables in Athena before Tableau users can start reading it in, correct?' ? If yes, how can I configure database & tables in Athena? also, how can I load my files from s3 into these tables? Please let me know if you have answers to this. I have done alot of work using AWS Athena and Glue to help visualise data that resides in S3 (and other data stores). Simply speaking, your data is in S3 and in order to query that data, Athena needs to be told how its structured. Athena understands the structure from the tables (meta data /definitions). Note there is no data in the tables it is simply a description of the structure. So how do we get these tables created? Thats where AWS Glue comes in. Glue can analyse your data in S3 (and any other data store if you need to) by running "crawlers" that look at your data and suggest a table definition(s) in a Data Catalogue. These tables can then be used by Athena to run queries against. "Cataloging Tables with a Crawler"
"Best Practices When Using Athena with AWS Glue"
Does anyone know what "tweaking" it may need wiht JDBC driver ? I put the driver in "C:\Program Files\Tableau\Drivers". But i can connect athena in SQL workbrench with the same user name and password. Do you know what's wrong with my issue? Our Athena data are encrypted. I don't see any option in Athena connector for Server Side Encryption. Any idea how to set this. BTW, In SQL Workbench, we use 'query_results_encryption_option' flag for this purpose. I have this exact same problem. The Connection config for Tableau allows server, username (AWS Key ID), password (AWS Secret Key ID) and port, and that is all! This makes the connector useless for all but the most basic setups. No encryption, no IAM role / policy using the host machine, nor any of the other JDBC properties listed on the AWS docs page e.g. I also don't see any way to directly edit the JDBC connection string that is built from the exposed fields. If we could just get to an advanced screen to add URL parameters to that JDBC connection string then at least we could get this working. You can create an athena.properties file which enables you to add all those advanced Athena JDBC Properties as key=value rows in the file. There are instructions in the kb on where the file goes on desktop vs server. It solves this issue. A shame the information is not written in the setup instructions, or in this article, or in the Athena driver download page, just on an obscure kb page. I have been working on getting this to run using the Athena tutorial database. I have managed to connect and see my elb_log table as a data source. When I try to load it the query fails. Is this type of connection actively supported? is there support for accounts with MFA?